The Spiral tool is a plug-in that allows a designer to easily create a fluid spiral shape. The Spiral tool can create spirals of any numbers of loops. For NEW performers, set the Red and Yellow Anchors on the Count Track to the count at which you wish the spiral to be drawn. To transition EXISTING performers into a spiral, move the Red Anchor to the count where the selected performers should “hit” the spiral shape. Move the Yellow Anchor to the beginning count of the transition into the new spiral. This is usually the previous set in the drill. Select the existing performers that will be moving into the spiral using a Selection Tool. See the Drawing Tools overview for more explanation between new performers and transitioning existing performers. Clicking on the Spiral tool will display the Spiral Tool Control Panel. The Spiral tool operates similar to the Circle tool. Spirals are drawn by clicking two points on the field display. The first click on the field will be the center point (or first endpoint) of the spiral. The second click will be the second endpoint of the spiral. The remaining performers will be drawn in automatically, depending on the number of loops you specified. You can change the number of loops of the spiral before committing the form to drill. Loops sets the number of times the spiral will loop. Reverse changes the direction of the spiral. Entering the interval in the Interval box will lock the interval and the form will maintain the interval while you move its editing handles. Since the interval between positions is locked, the form would grow or shrink by changing the number of positions in the form. Mixed Intervals are also entered by pressing the button. 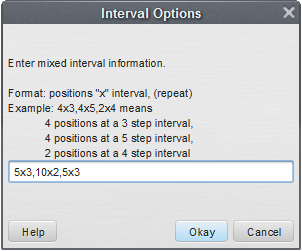 This option will allow you to have different intervals in one form. Mixed Intervals are extremely useful when charting large instruments or instruments that are close together but vary in size (drum lines, for example). Mixed Intervals can be entered before or after you create your shape, but must be entered before you Accept the form. Many of the options in the Spiral Tool Control Panel are exactly the same as options in the Line tool. Refer to the Line tool for details on the Clone, Alignment, Symbol, Color, Editing Handles, and Reposition Handles. See Matching Lines for an explanation of the Matching Lines functions. *The Spiral tool is a separate purchase on Basic and Interactive editions, and is included with the Professional edition. See the Interactive Features page for more information on purchasing the plug-in.